Melanin, a form of pigments, doesn’t only occur in the skin, brain and eyes. In humans, melanin[ii] is found in skin, hair, the pigmented tissue underlying the iris, the medulla and zona reticularis of the adrenal gland, the bones, heart, the stria vascularis of the inner ear, and in pigment-bearing neurons of certain deep brain nuclei such as the locus ceruleus and the substantia nigra. 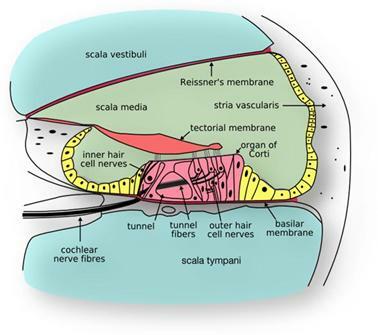 The area in the ear, called the stria vascularis, where melanin is found, is of special importance to AIT as it possibly represents both a locus of toxicity and a rationale for a probable mechanism for detoxification, as it is energized by acoustic energy, likely aiding in the restoration of auditory lesions through intensive acoustic stimulation. Melanin Containing Hormone R2 is only found in some primates and carnivores, including ferrets, dogs and man. Larsson[iii] explains that various drugs and other chemicals, such as organic amines, metals, polycyclic aromatic hydrocarbons, etc., are bound to melanin and retained in pigmented tissues for long periods. He stresses that the physiological significance of the binding is not evident, but it has been suggested that the melanin protects the pigmented cells and adjacent tissues by absorbing potentially harmful substances, which then are slowly released in nontoxic concentrations. Long-term exposure, on the other hand, may build up high levels of noxious chemicals, stored on the melanin, which ultimately may cause degeneration in the melanin-containing cells, and secondary lesions in surrounding tissues. E.g. in the inner ear, the pigmented cells are located close to the receptor cells, and melanin binding may be an important factor in the development of some inner ear lesions. He speculates that neuromelanin in the brain, is present in nerve cells in the extra pyramidal system, and the melanin affinity of certain neurotoxic agents may be involved in the development of parkinsonism, and possibly tardive dyskinesia, whereas I would like to speculate that in young children, it might be one of the key contributing reasons why we see such significant sensory disturbances (ocular and auditory) in children with autism. In an interesting article[iv] a webpage documents that researchers at the University of Missouri-Columbia can now detect the spread of skin cancer cells through the blood by literally listening to their sound. The method used is photo-acoustic detection, whereby both laser and ultra-sound are combined to make the cells vibrate (laser) and then the vibrations are registered by means of the ultrasound equipment, hence giving researchers the high-pitched sound of melanoma cells. Melanin can absorb energy, either photic or acoustic. The author writes: “The dark, microscopic granules of melanin contained in the cancer cells absorb the energy bursts from the blue laser light, going through rapid cycles of expanding as they heat up and shrinking as they cool down. These sudden changes generate loud cracks — relative to the granules’ size — which propagate in the solution like tiny tsunamis.” For the first time a technological breakthrough like the one cited above, gives us the possibility of registering the sound from energy accumulating melanin receptors, that can be recorded. “The sound waves produced by melanin are high-frequency ultrasounds, meaning that they cannot be heard by the human ear, even if amplified. However, researchers can pick them up with special microphones and analyze them with a compute”. The implications for AIT is that in order to stimulate the stria vascularis to produce more endolymph, and to release toxic compounds bound to these cells, there needs to be fast-paced, high frequency acoustic energy bursts present in the modulated music. Melanin in the Stria Vascularis is also thought to play a role in noise-induced hearing loss, report Bartels et al. [v] in their summary of their research on different coloured mice. A factor that influences one’s susceptibility to noise might be regulated in the stria vascularis by means of melanin. In their research, Barrenäs et al [vi] report that changes in the melanin morphology, concentration and distribution have been correlated to the development of the inner ear and to the time period during which hearing function is established, which indicates that the melanocytes in the stria vascularis are of importance for the hearing function. I hereby hypothesize that early exposure to toxic metals (in utero) or shortly after birth, might predispose some children to significant susceptibility to noise, as the melanocytes bind toxic metals and might cause inner ear lesions. This is exactly what AIT offers – fast-paced alternation between high and low frequency bursts with a high margin of randomicity. [i] Nordlund,J.J., Boissy, R.E., Hearing, V.J., King, R.A., Oetting, W.S. & Ortonne, J.P. , 2006. The Pigmentary System, 2nd Ed., Wiley-Blackwell. [iii] Larsson, B.S. 1993. Interaction Between Chemicals and Melanin. Wiley Inner Science. [v] Bartels, S., Ito, S., Trune, D.R. & Nuttall, A.L., 2001. Noise-induced hearing loss: the effect of melanin in the stria vascularis. Elsevier Science B.V. In Hearing Research Volume 154, Issues 1-2, April 2001, Pages 116-123. References and further reading may be available for this article. To view references and further reading you must purchase this article. [vi] Barrenäs ML, Axelsson A. The development of melanin in the stria vascularis of the gerbil. In Acta Otolaryngol. 1992;112(1):50-8.